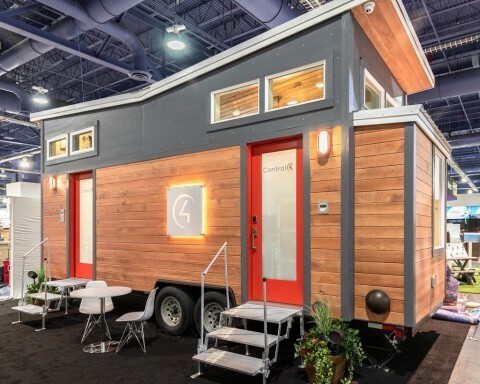 LAS VEGAS--(BUSINESS WIRE)--Feb. 19, 2019-- International Builder Show booth SU443 – Control4 Corporation (NASDAQ: CTRL), a leading global provider of smart home solutions, announces the debut of the Control4® Tiny Smart Home, a compact, 250-square-foot smart home designed to give architects, builders, and designers an interactive, design-forward smart technology experience at Design Construction Week 2019 at IBS in Control4 booth SU443. The Control4 Tiny Smart Home gives an authentic at-home feel combined with a fully-loaded smart home system, complemented by construction and beautiful design by Sprout Tiny Homes. Across the lofted bedroom, compact kitchen, and divided living space, there are dozens of entertainment and control devices to interact with using custom-engraved wall keypads, handheld remotes, touch screens, mobile devices, or voice control. The Control4 system includes many popular smart home features, such as smart lighting and shading, multi-room audio with Triad speakers, Control4Intercom Anywhere, video distribution, temperature control, security, and more.